There are a lot of reasons to be thankful for “Sorry to Bother You” — one being that it represents the return of the inspired/demented midnight-movie satire — but the rise of Lakeith Stanfield to leading man status is probably the most satisfying. Some of us were lucky to have caught this lanky, otherworldly actor as a suicidal teen in his first films, the short version of “Short Term 12” (2008) and then the feature version (2013). After that, he started popping up in the corners of everywhere: as a doomed civil rights activist in “Selma” (2014), as Snoop Dogg in “Straight Outta Compton” (2015), as a sweetly hapless junkie jazzbo in “Miles Ahead” (2015). Lately you know him as the guy who yells “Get out!” in “Get Out” (2017) and as Darius on FX’s “Atlanta,” in which he turns the stock role of the wacky best friend into something close to moonbeam poetry. The man is clearly not of this earth, but rapper-turned-writer-director Boots Riley is the first to put Stanfield front and center, just to see what happens. The actor plays Cassius Green — “Cash” to his friends — an Oakland dude trying to get by in the modern gig economy. The first scene sees Cash cooking up a fraudulent resume to impress the manager of a seedy telemarketing company; in short order, he’s exposed, mocked, congratulated, and hired. “Sorry to Bother You” is the story of how Cassius struggles at his new job until he discovers his “white voice” — a friendly nasal tenor dubbed in by comedian David Cross — at which point his phone sales take off into the stratosphere and he confronts the pleasures and perils of selling out. Any echoes you might pick up of “The Sellout” (2015), Paul Beatty’s outrageous satirical novel of black American life in the 21st century, are probably not coincidental. The Boots Riley approach to filmmaking seems to partake of equal parts Beatty, Kurt Vonnegut, the Firesign Theatre, the 1969 comedy “Putney Swope,” early Brian De Palma, peak Melvin Van Peebles, the kitchen sink, and a whole lot of Mothership Connection. 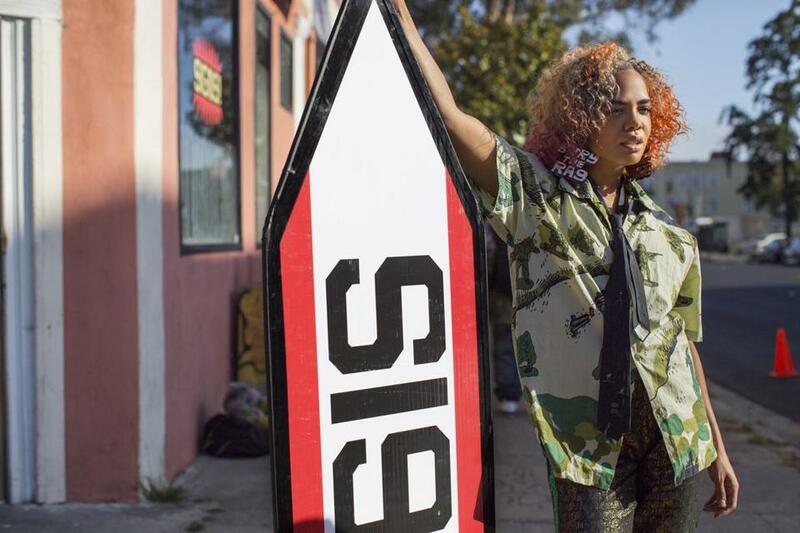 The activist turned filmmaker explains how breaking reality can help us better understand it. The filmmaking is rough and exuberant: When Cash calls up his assigned victims, a split-screen isn’t good enough for Riley — he drops the hero, desk and all, into the middle of people’s living rooms while they eat, fight, make love. Once the hero has his breakthrough — coached by a weary elder played by Danny Glover — Cash ascends to the airy upper floors reserved for the Power Sellers, a paradise of white entitlement that looks like an executive Starbucks. Meanwhile, an underground collective of art terrorists monkey-wrenches billboards and other mediums of the Man, and the lumpen-telemarketers left behind by Cash rally to unionize. Cash’s girlfriend, Detroit (the ubiquitous and invaluable Tessa Thompson), has her own conceptual-resistance thing going on, and while the narrative of “Sorry to Bother You” follows an over-familiar arc of ambition, pride, fall, and atonement, the details are hilarious and quite a bit sharper than you may first realize. It’s a movie that engages the masks that people of color put on and take off as a matter of getting through the day in this country — Riley is nodding, of course, to an entire history of masks, from the Colonial era to the age of rap — and that’s also alert to the trauma behind the exhausted absurdities of working-class life. 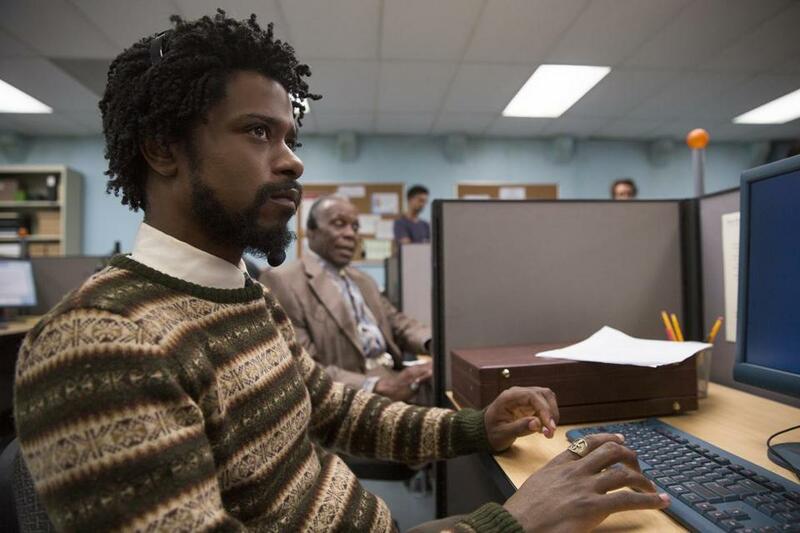 “Sorry to Bother You” is one of two recent Sundance hits to take place in Oakland (the other is “Blindspotting,” opening in Boston theaters July 27), and the movie’s vibe seems not just lived-in but From There, with all the relevant makeshift dings and dents. At a certain point, Riley’s wild comic vision takes a left turn and leaps off a cliff, and if you’re lucky, you’ll leap, too, and not care about the parachute. “Sorry to Bother You” is a joyful mess that makes more sense than any American movie I can think of at the moment, and what holds it together are the angry wit barreling beneath its lunacy and the deft balancing act of its star. Stanfield wears the suit of his leading role with a mixture of innocence and avarice, much like the character he’s playing. Cash’s shoulders are stooped with the weight of his angel, Detroit, on one side and Lift, the devil CEO, on the other, and Stanfield, one senses, is sizing up stardom with the same hungry, humorous, haunted eyes. They’re simultaneously reaching out to take what’s theirs and shrinking as they calculate the cost to their souls. “Sorry to Bother You” says that’s a daily transaction for most people in this country, and it wants you to laugh until it hurts.